I consider myself to be a fairly organized person. Not so organized that I’m obsessed with it, but enough so that I can almost always find what I’m looking for at home or at the office. Being able to quickly identify individual items as well as the contents of boxes, drawers and bins plays a big part in keeping things organized. Labels are absolutely essential in this regard. I use labels for just about everything you can think of as well as many out of the ordinary tasks like cable organization in my home recording studio, fuse box circuit breaker identification, nametags at parties and other events, etc. Unfortunately, I’ve always found label makers to be lacking in one area or another and never providing all the features I’d like in one unit... that is until now. 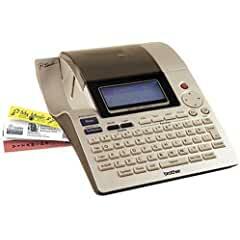 Enter the P-touch PT-2700 Electronic Labeling System from Brother. The PT-2700 is both a stand-alone and computer controlled label maker. It can run off of 8 AA-size batteries or the included AC adapter. This makes it the most versatile label maker I’ve seen because it can be used either in a stationary location or a remote location where AC power is not available. You can keep batteries loaded even when using the AC adapter, which is actually recommended because if you unplug the PT-2700 (without batteries) any settings you have changed will be lost. After applying power to the unit, you insert the included sample TZ tape cassette, press the On/Off button, Feed & Cut the tape (to remove any slack), and off you go. You can immediately start typing on the mid-sized QWERTY keyboard to create a label. This entire procedure, as well as everything else you need to know about the PT-2700 is covered in the included user’s guide. Once you’re up and running in stand-alone mode, you can simply start typing the text you would like to see on your label. As you type, the text will appear on the back-lit, LCD display. Initially, the text is shown in edit mode, but a quick press of the Preview button will show you what the label will look like when printed. In addition to text editing, the look of a label can be controlled in many different ways, such as fonts, formatting, symbols, and layouts. Built-in to the PT-2700 are 11 categories of symbols that you can add to a label in addition to text. These categories include: Punctuation, Business, Mathematics, Bracket, Arrow, Unit, International, Number, Pictograph, Electrical, and Others. Also provided is a set of accented characters. The appearance of the text and symbols can be changed by setting character attributes: font, size, width, style, line, and alignment. The PT-2700 has 8 fonts, 9 sizes, 5 widths, 11 styles, 3 line styles, and 4 alignments built-in. The look of an entire label can be changed through the use of frames, templates, and block layouts. Frames are graphical borders that surround the edges of a label and there are 21 different frames provided. Templates provide pre-formatted labels for specific tasks that can be customized. Templates include binder spines, file folder tabs, cable wraps, CD case spines, and more (17 in all). Block layouts provide quick text sectioning where different text formats are placed in a single label space. Together, these features allow you to quickly create many different types of customized labels in a short time. Your edits can also be saved to memory, which (as I mentioned earlier) is maintained by installing batteries. Up to 99 label designs can be stored. Even with all the label editing features the PT-2700 provides built-in to the unit, there are still limits. To overcome this problem, the unit also provides computer connectivity via USB. You simply install the included software and plug the PT-2700 into any available USB port. The software runs on just about any Windows or Mac machine and provides all the features you need to create just about any kind of label you might need. The only real limitation is the size of the tape you are using. The software allows you to use any font that you have installed on your system. You can also import and use any available clipart (just keep in mind that all printing is in one color – I’ll talk more about the TZ tapes in the next section). In addition to the label creating freedom that the software provides, there are also some other advanced features that make it even more useful. My favorite feature is the software’s ability to read data from a Microsoft Excel spreadsheet and use that data to print a large number of labels, each customized with specific text. For example, let’s say you have hundreds of contacts in an Excel file and you want to create a custom mailing label for each contact. Using the same example, the software can also grab your contact data from Microsoft Outlook. Since receiving the PT-2700, I’ve used it extensively to create many different kinds of labels and it has performed beyond my expectations. My only complaint (just a minor gripe really) is the cost of the TZ tape cassettes. Depending on how many (and the types of) labels you need to create, these cassettes can be expensive. Then again, you do get what you pay for in terms of quality. The TZ tapes come in a variety of sizes, colors, and types. The PT-2700 supports the following tape sizes in width (the length of a label is determined by how much text it contains with the max length being 12”): 9/16", 1/4", 3/8", 1/2", 3/4" and 1" wide. Depending on the type of tape, there are a wide variety of colors to choose from, but all tapes are dual-colored, meaning one color for the text and one color for the background. There are also a wide variety of tape types: AV Labels, Laminated Tape, Fabric Iron-On Tape, Acid Free Adhesive Tape, Tamper Evident Laminated Tape, Flexible ID Laminated Tape, and Extra Strength Adhesive Laminated Tape. The special types of tape (ie. Fabric and Extra Strength) are the most expensive and the larger the width, the more expensive the tape. I have only tried the Laminated Tape so far, but I plan to test different tapes and will most likely provide an update in the future. In the meantime, the Laminated Tape performed excellently. When you print a label, it comes out automatically laminated so that the printing won’t smudge or rub off... another favorite feature of mine. In addition, as the label is being printed, the PT-2700 automatically cuts a slit in the backing so that it is very easy to peel off when applying the tape. By default, the PT-2700 is set to trim a label at both ends, which can eat up quite a bit of extra tape. Luckily, there are a number of tape cutting options you can set to choose the size of margins so less tape is cut between labels. Being jam-packed with features, I think most anyone would be hard-pressed to find a labeling need that the PT-2700 doesn’t fulfill. As a stand-alone unit, the PT-2700 provides the means to create a wide variety of labels, but when combined with computer connectivity, the labeling possibilities are almost limitless. So unless you need labels that are wider than 1”, I have no trouble in saying that the PT-2700 is the best choice in electronic labeling systems.